It is challenging to convince the society or even the patient and his family sometimes, that this is an illness that needs to be recognised. Mental Health has entered the drawing room conversation at last. People are openly discussing now unlike before when issues related to mental health were talked in whispers as one with a mental disorder would be dismissed as mad. In the recent times some well- known personalities have also come out and admitted that they had to battle some form of mental disorder. When one talks about mental health, it can mean a whole lot of things and of various degrees. In the present world, the most common disorder plaguing a large number of people are issues like depression and anxiety disorder. All of us have to deal with stress in our lives in some form - whether in our professional or personal lives. This is often the cause of a mental disorder, namely depression. However, two persons can be in the same situation and react in different ways altogether - where one may come out of the situation unscathed; the other may get into depression. This does not necessarily mean that one is mentally stronger than the other. I shall deal with depression in this write-up, what clinically is termed as Major Depressive Disorder (MDD). Depression is known to increase mortality in patients with heart disease. Depression is a common illness worldwide, with more than 300 million people affected. Depression is most common among females (5.1 per cent) than males (3.6 per cent). The total number of people living with depression in the world is 322 million. Nearly half of these people live in South-East Asia Region and Western Pacific Region, reflecting the relatively larger populations of those two Regions (which include India and China, for example). The number of persons with common mental disorders globally is going up, particularly in lower-income countries, because the population is growing and more people are living to the age when depression and anxiety most commonly occurs. More than 56 million Indians – or 4.5 per cent of India's population – suffers from depression at this moment followed by China where 4.2 per cent of its population – 54 million– suffers from this disorder. 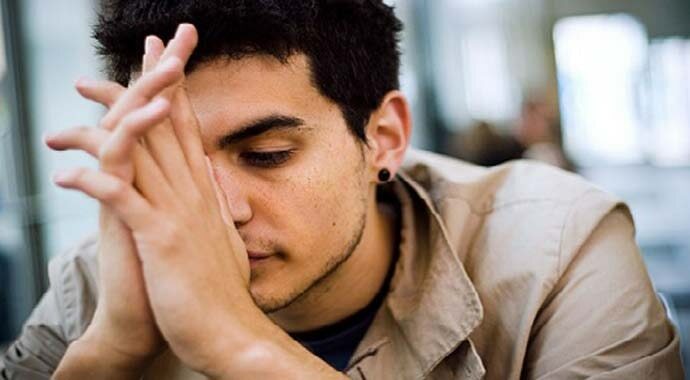 Another 3 per cent or 38 million Indians suffer from anxiety disorders. This means 7.5 per cent of Indians suffer from major or minor mental disorders that require expert intervention. Depression is ranked by WHO as the single largest contributor to global disability. It is also the major contributor to suicide deaths, which number close to 800 000 per year. Worldwide, the prevalence of depression increased by 18 per cent from 2005 to 2015 according to the report. In October 2016, the National Institute of Mental Health and Neurosciences (NIMHANS) in Bengaluru released a mental health survey that said that the incidence of depression is roughly one in every 20 Indians or 5 per cent of the population. The fact that nearly 11 per cent of Indians above 18 years are suffering from mental disorders and most of them do not receive care for a variety of reasons deserves the urgent attention of our policymakers and professionals. Depression to a large extent is still a dirty word. The most important thing about depression is that one never knows when or who it will strike. Although most people associate depression with a state of sadness, it is a misnomer. Depression is an illness, and it may manifest in different ways in different people. Often mental diseases are hard to understand, and this complexity can cause people to misunderstand the disease. Depression can be caused due to a combination of biological, environmental and psychological factors. Though it usually begins in adulthood, more and more children and adolescents are now being diagnosed with the disease. It is challenging to convince the society or even the patient and his family sometimes, that this is an illness that needs to be recognised and like many other illnesses appropriately treated. Symptoms of depression will vary from person to person but the early signs of the disease may include the following: fatigue and low energy, body aches, headaches and cramps, irritability, insomnia/excessive sleep, feeling of guilt, worthlessness, losing interest in activities, difficulty in concentration/making decision, change in appetite and weight, morbid thoughts, lack of confidence and social withdrawal. As yet there are no conclusive causes for depression and some of the risk factors are: Mental trauma/abuse, genetic factors, substance abuse, loss of a loved one, certain diseases/ medications and life changing events like relationship problems or change of residence. There is another temporary disorder called SAD (Seasonal Affective Disorder) which affects a lot of Americans and the latest one is Facebook Disorder triggered by social media addiction in which the patients shun human contact. Although it is not yet conclusively known as to how the brain function changes to produce depression. Findings pinpoint to the fact that certain changes in the brain neurochemistry take place. We have neurotransmitters in our brain that are responsible for the firing of neurons and transmission of electrical signals in the brain. Depression is associated with an imbalance of certain such neurotransmitters. According to WHO report talking of various mental disorders it says that depressive disorders are characterised by sadness, loss of interest or pleasure, feelings of guilt or low self-worth, disturbed sleep or appetite, feelings of tiredness, and poor concentration. The report also mentions that few people receive treatments due to many reasons; one of them being the social stigma attached to mental disorder. A dearth of trained healthcare providers it is a problem also. India, for instance, has less than 4,000 psychiatrists to treat its mentally ill people. Depression has physical repercussions too. The patient may experience trouble in concentration, indecisiveness, changes in sleep pattern, changes in his appetite, changes in body weight, imaginary pains in the body, restlessness and irritability. Depression is now known to increase the chance of dying when it is associated in patients with a heart attack than those who have a heart attack but are not depressed. In this stressful life of ours how about taking steps to stave off depression? Listening to music, practising yoga as apart from physical postures it focuses on breathing (pranayama), writing down one's negative thoughts, talking to a friend over a cup of tea or phone (not virtually), learning new things, reviving childhood hobbies whether music or painting - all this contribute to our emotional well-being. Mindfulness in these activities insulates us from stress, anger and negativity. A diet rich in essential vitamins and minerals can be helpful to elevate one's mood. Avoiding alcohol and tobacco and eating healthy is critical. Also read: Union Budget 2018: Is the middle class the biggest loser?